If you want to achieve and maintain a healthy weight, you have to be physically active. In fact, the surgeon general recommends getting at least 30 minutes of moderately intense activity a day in addition to your usual daily activities. Another way to make sure you’re exercising enough is to chalk up at least 10,000 steps a day — that’s about five miles of walking or running. You can buy an inexpensive pedometer to gauge your steps, but a slew of new self-tracking devices are available that do so much more, calculating things such as how many calories you’ve burned or how well you’re sleeping at night. Here's what the best of the next-gen devices have the offer. Given the ubiquity of the smartphone, many people no longer wear a watch. If you do, however, the Basis B1 Band is a great choice. Not only does the display default to show you the time in large, easy-to-read numbers, it’s a sleek, modern-looking device that actually looks like a watch, unlike some of the others I tested. You can see some of these metrics by tapping small metal buttons on the watch face, and a bar under the time shows your progress toward meeting your activity goal. But for more detailed charts that reflect how your activity and sleep stack up over time, you can visit a Web dashboard after you connect your Basis via USB to your computer and uplaod your data. You can also sync your device with an Android or iOS app that will pull data from it up to the Web as well as let you see detailed metrics on your phone. I found it particularly interesting to see some of these numbers regarding sleep. It made me wonder why I sweat more or less or have a higher or lower heart rate during certain parts of the night. Dreaming, perhaps? 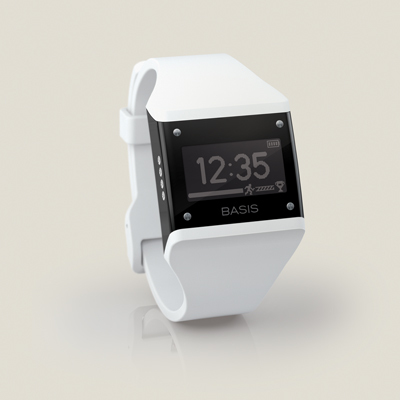 In addition to offering you hard data about your nocturnal movements and metabolism, the Basis tracks habits or goals such as waking up or going to bed at the same time every day, torching more calories or getting up from your chair to move around for a certain amount of time during the work day. As you do better meeting such goals, the Basis lets you unlock more of them, so you’re constantly in improvement mode. One nice little feature I appreciate about the Basis is that the device's back light engages automatically when you turn your wrist to look at the time. Both sides of the wristband detach, although charging and syncing work better when they're attached to the unit. You can wear the Basis in the rain and shower, but the device is not made for swimming. The one consistently annoying thing about smart activity trackers is that most of them need to be charged every few days. Not the new SYNC Burn Fitness Band. Its maker says the device will stay charged for a year. When it finally dies, all you'll need to do is pick up another CR2032 battery from wherever you normally buy batteries. What I like about the SYNC Burn is you can set it to always show steps, calories burned or distance traveled. If your goal is to walk 10,000 steps a day, you can just look at the watch to see your progress without having to push any buttons. If you’re more concerned with calories, you can set it to always show your burn number. The time and date are always at the top of the display so that the Sync Burn works as a watch, as well. 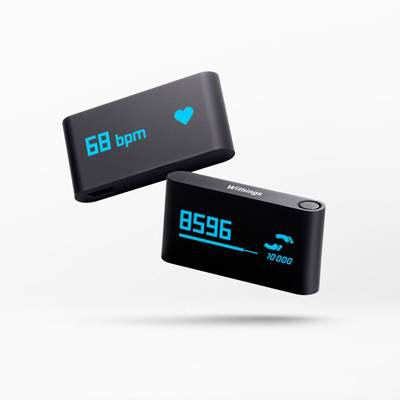 To improve the accuracy of how the SYNC Burn calculates caloric burn, push and hold a button on the bottom of the device throughout the day to measure your heart rate. A button on the bottom right syncs the device data to the MapMyFitness app running on an iPhone 4S or iPhone 5. You can scroll back to check your activity metrics up to seven days in the past. To turn on the backlight ,you have to press both buttons on the side of the device simultaneously. The watch straps are removable and reversible, so you can choose to wear all black, all red or both. In short, this device’s best attributes are its long-lasting battery and how it keeps the activity metrics you care most about front and center. The SYNC Burn does not track sleep and while you can swim with it on you shouldn’t push any buttons on the unit when doing so or diving below 98 feet. 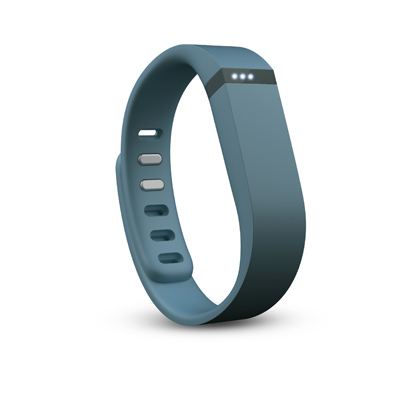 The Fitbit Flex is a small black rectangular motion sensor that you wear inside a rubber wristband. The sensor needs to be charged with a USB cable every five days or so, which is why it’s removable from the wristband. To begin tracking activities, you need to set up your Fitbit account either on Fitbit.com or within the Fitbit mobile app for iOS or Android and input things like your age, height and weight as well as various activity or caloric burn goals. With its simple and beautiful tile interface, you can easily see how you’re progressing toward your goals. For people truly embracing a healthy lifestyle, the Fitbit Flex’s web and mobile apps let you keep track of a variety of metrics. If you log what you eat, the Flex will add up how many calories you’ve consumed and tell you how many calories you can eat for the rest of the day based on how many you’ve burned. You can also log how much water you’ve drunk as well as your current weight, heart rate, blood pressure and blood glucose levels. And if you own a Wi-Fi-enabled scale such as a Fitbit Aria or a Withings scale, your weight will upload to the Fitbit platform automatically. If you tap the band several times before you fall asleep and again when you wake up, information about your sleep will show up in your Fitbit account. The web or mobile app will tell you what time you went to bed, how long it took you to fall asleep, how many times you woke up, how long you were in bed and how long you actually slept, as well as a percentage score indicating the efficiency of your sleep. As for wearing the device, I often forgot I had it on. I like how it looks; it reminds me of a classy, high-tech version of the rubber bracelets people wear, minus any wording. Unlike the other activity trackers I tested, the Fitbit Flex does not tell you the time. Even so, it does have a silent alarm function you can set with the web app or the mobile app (only if your device is Bluetooth 4.0-enabled for the latter). When the alarm goes off, the wristband vibrates until you tap it several times. While you get plenty of information about your activity using the Web app or mobile app, the only activity data you can glean from the Fitbit Flex itself is how you’re progressing toward your goal, which it shows you by turning on one to five LED lights after you tap it twice. 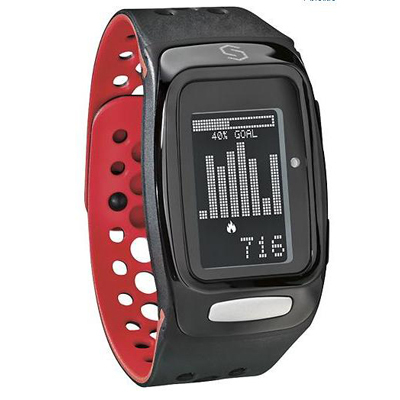 It also lights up, flashes and vibrates when you hit your activity goal. The thing I appreciated most about the Fitbit Flex is you don’t have to manually sync it with Fitbit.com or with the Fitbit app on your smartphone. If you keep the device’s tiny wireless sync dongle plugged into a USB port on your computer, every time you come within 20 feet of it, the data from the Fitbit Flex is uploaded to your account. The Fitbit Flex comes with two wristbands, one for smaller wrists and one for larger ones. At first I found it rather difficult to snap the wristband closed, but after doing so several times, the holes in it were more forgiving to the clasp. While the sensor is water resistant and can withstand a dunk in water up to 10 meters deep, Fitbit says it’s not designed for swimming. Price: $100 at Amazon and fitbit.com. The Misfit Shine is a quarter-sized, futuristic-looking device you can wear on your clothing, on a sport or leather band on your wrist or as a necklace. 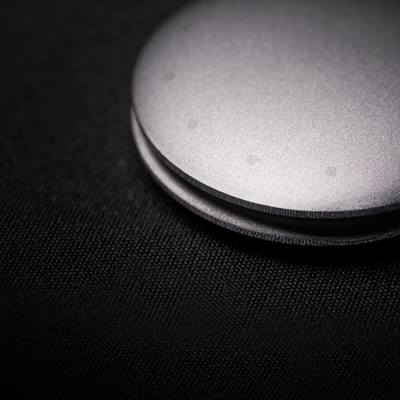 It’s a beautiful device made by Misfit Wearables, a company co-founded by former Apple CEO John Sculley. The Shine shows you two things when you tap its brushed metal surface twice. Twelve lights around the perimeter indicate your progress toward meeting your activity goal; for example, three lights indicate you’ve accomplished 25% of your goal. Next, the Shine shows you the time by dimly lighting the quarter hour positions for orientation, brightly lighting the hour position and blinking the minute light. Within the Shine iPhone app, you determine what activity level you’re aiming for and earn points according to how well you perform meeting that goal. The clean and beautiful app also shows your steps taken, calories burned and distance traveled, as well as highlights of your day such as times when you were more active and milestones you hit. Triple-tap the unit at the beginning and end of certain activities to log them (although you have to specify within the app whether the triple tap correlates to tracking sleep, cycling or swimming). The Shine is water-resistant for swimming, and its accelerometer senses biking and running on a treadmill, but you might not get full credit for lifting weights. Like when you wear the Fitbit Flex, you might forget you’re wearing your Shine. The CR2032 battery lasts for four months and is easy to replace with the special tool that comes with the unit. The purchase package includes the Shine tracker, a sport band and a clasp to attach it to your clothing. Price: $199.99 at the Misfit Wearables store or $99.92 on Amazon for a package that includes the Shine tracker, a sport band and clasp to attach it to clothing. Don’t let this unassuming black rectangle fool you — it’s packed with some nice features. To use the Pulse, install the Withings Health Mate app on your iPhone or Android. After pairing your Pulse with your phone via Bluetooth, depress the device’s only physical button for three seconds to transfer data to the app. The app shares your metrics with the Withings web app, which communicates the same information as the mobile app but also features a useful heat map that shows patterns in your activity and sleep for the entire week. Even though the Pulse looks inconspicuous, it holds a lot of data. The accelerometer measures steps taken, elevation climbed, distance traveled and calories burned. You can see all these metrics one at a time by tapping the unit’s sole button. The current time is also in this lineup of numbers, as are icons you can tap to start tracking your sleep or check your heart rate via a tiny optoelectronics sensor on the back of the Pulse. If you swipe the front of the Pulse, you can see up to 10 days of history. The Pulse handles sleep tracking admirably. It comes with a soft fabric sleep wristband that holds the Pulse device on your wrist to monitor how much you move during sleep. To turn it on, tap a moon icon on the device when you get into bed and again when you awaken. After syncing the Pulse with the mobile app, you can see how many minutes you spent in bed, how many minutes you actually slept, the total time you slept and how many minutes you were in deep and light sleep modes. If you own a Withings Internet-connected scale (which I happen to use and highly recommend), your weight measurements automatically load into your Withings account, joining all the information the Pulse gathers such as heart rate measurements and activity levels over time. The Withings Pulse comes with a rubber clip so you can attach it to a belt or the front and center of a bra. You can also let it hang out in your pants pocket along with your loose change. I have been using the fitbit for about a month now. It is so motivating to “check in” and see where I am in my 10,000 step goal each day - I park further away to walk more - I step out during the day and walk around the block - I even pace in the living room at night if I am close! The friends option is fun as well - my best friend and I check in and even engage in a little friendly competition now and again. I don’t even notice that it’s on my wrist anymore. Plus, the sleep monitor and calorie calculators are very informative. I think it’s awesome!! This article is both a technology review and also talks about health. No matter what you use being active and healthy is great. I personally use a couple of devices. I have a pedometer which counts the miles, km, and calories used in combination with my watch, I can manually keep track of my walking using google drive. In addition, I have a Ipod nano refurbished from Apple which has a Nike + app which keep tracks for me. The downside is I have charge the nano every so often. I manually keep track of my physical activity with google drive. All these devices work well, it just depends on your needs. So keep up the physical activity. I was interested in your assessment of UP by Jawbone. I used one when it first came out and found it useful - until it died. Thinking of replacing it and wondered how it compared to others on the market. I have been wearing mine since Dec 2012. It’s unobtrusive and can be worn for up to ten days before charging that takes less than 90 minutes. I don’t wear it in the shower and the sliding top is easy to misplace or even lose. (Up will replace it free) I suggest buying one from Jawbone and pay full price. This expedites support. It’s software has several updates. Now for the negatives. There seem to be issues with reliability that continue to dog the bracelet. I’ve just replaced mine for the second time. Software updates are not as intuitive but give more info. There is a trade off. Since my September posting another UP was supplied by Jawbone in a timely manner, but my original warranty is passed. If I need a new device will more than likely get a Fitbit Force. I love it. Simple to use & clips very tightly to whatever. It motivates me to reach exercise more and gives me something to shoot for. I have recommended it to my son, daughter and cousin and two have already purchased. I tell everyone about it. I don’t understand why the Basis Watch is ever written up. It is not available for sale. When the story was published, the watch was still available on Basis. I’ll check with Basis to see why it seems to have been taken off the market. Apparently, they can’t produce them fast enough to meet demand, because you have to get on an ‘invitation list’ on their website and they send an email when they have them for purchase and then its first come first serve. Spoke with Basis and they are behind on production. It takes about a week to get the invite to purchase. In early October, they expect to have enough supply to open their store for orders again. You covered the Fitbit Flex, but left out the Fitbit One, which is similar, but actually superior - has a display, longer battery life, etc. How about the NIke Fuelband? How do you access that function? Push on the tip of the band when you hit the pillow. In the morning it will graph the type of sleep from deep to less including times you wake up. I dont know about the push button bit but I just wear mine ‘forever’ and when you check your graph (post sync) the graph shows your activity level during the sleep hours. Ideally you should flatline. So when I wake and dont feel rested ( my mattress is awesome) the graph offers some explanation..if I was active…it shows on the graph and I dont flatline. So it helps me investigate what changed in my bedroom or my head that didnt let me sleep better and thus work to rectify/avoid such. it does that I think by tracking your movement while sleeping. Same as with the others too. I’m surprised that the fitbit band is in here, but not the Nike Fuel band. A device that can double as both a fitness tracker and fashion accessory more readily than the fitbit. It’s hidden display is a nice little party trick too as it can tell time as well as track your activity. Skulpt Aim is a new device that measures the muscle quality of individual muscles instead of just size. Also, it gives the fat percentage and total body muscle quality and muscle percentage. Check out www.skulpt.me Really cool! Reading the title of the article, I thought it would be about phone apps. Except for swimming, tracking physical activity with my phone means I also have my music with me. I don’t have to think about charging it, because I can charge it anywhere. I’ve used numerous wrist GPS heart rate monitors, they have all been replaced by my phone. It’s just so easy with my phone. I can view my routes on google maps while I’m riding or running. I’d like to see a fair review of these apps and more importantly, I’d really enjoy reading the feedback. I want to purchase a fitness tracker however I don’t want to upload my information to any website. Can I use one of the trackers without uploading? Also how would I view the readings?